JLR's global sales fell 12 percent to 251,590 in 2008. Pictured is the Range Rover Sport. Embattled Jaguar Land Rover is close to agreeing cost-cutting measures with its workers. The British carmaker, which Ford Motor sold to Tata Motors for $2.3 billion last summer, needs to reduce costs after a steep fall in its unit sales. 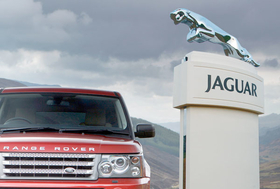 JLR's global sales fell 12 percent to 251,590 in 2008. JLR spokesman Don Hume said: "After several constructive discussions with unions we have reached agreement on a set of proposals that will now be put to union members." Hume declined to reveal what the proposals were, but said they were intended to reduce costs in the business and avoid the need for further compulsory job losses. JLR laid off 500 manufacturing workers at the end of January and will cut 150 agency staff at the end of April. About 850 agency workers were released in December and JLR is currently asking 300 management staff to leave voluntarily. Union bosses are asking JLR's 12,000 workers to accept the cost-cutting deal. Dave Osborne, an official with the UK trade union Unite, said he hoped workers would vote to accept the deal on the basis that it is a temporary agreement for a two-year period. Said Osborne: "We are in a crisis here through no fault of our own. The workforce has been a huge asset to the company in the past and will continue to be so in the future. We are pleased that we have been able to reach this agreement." Tata Motors lost 2.63 billion rupees ($54 million) in last quarter of 2008 as cost-cutting efforts failed to make up for lower demand, high commodities prices and foreign exchange losses. The company does not separate Jaguar Land Rover financial results.